Welcome to Shady Brook Angus Farms. The story starts in 1973, when Tony & Lucy Santini decided to buy their first Angus cows. Acquiring breed giants such as Sitz Everelda Entense 1137, BT Everelda Entense 76D, GAR EXT 614, GDAR Forever Lady 719, Miss Wix 918 of McCumber, & Sitz Henrietta Pride 501. Through time, Shady Brook also found and bred other leading females of the breed, such as Shady Brook Ever Entense 35H, Shady Brook Ever Entense 491G, Shady Brook Ever Entense 495G, BT Everelda Entense 139D, GAR EXT 604, GAR Precision 2168, GDAR Forever Lady 718, & GDAR Forever Lady 98. These females are still in the forefront of the Angus business today. Tony always focused on the quality of the cattle—if he found animals he believed in, he would go after them. To demonstrate his keen cattle sense, he selected young calves that he saw the potential in, such as Boyd New Day 8005, whom he found at the National Western Stock Show in Colorado; SAV 8180 Traveler 004, whom he found at High Field Farm in NY; as well as the legendary Pine Drive Big Sky. In 2003, Tony decided that he wanted to take a break from the Angus business, so Shady Brook had a dispersal. In 2004, his son Vince decided he wanted to take a try at following in his father’s footsteps. Vince had always been involved in farming the land and its daily operations at Shady Brook, so he looked to his father for guidance with the cattle. 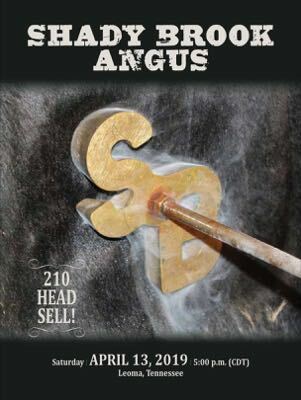 With this, Shady Brook is again building their dominant cow herd and leading the way in the Angus industry.